“I don’t want to speak,” said Syrian-American artist Mohammed Hafez, pacing the floor of his exhibition at the Brooklyn Museum. Hafez moved to the US from Syria 15 years ago and has been making art ever since. The work that made him famous was a response to the fear of Islam that followed the 9/11 attacks. The stereotypes Syrians face have changed since then, as has Hafez’s work. As news of Syria’s protracted civil war spread throughout the world, the global image of the country began to shift to encompass the loss – of life, of history, of heritage – that has been due to violent conflict. Including the destruction, by ISIS, of a 1,200 year old minaret. A doll-sized porcelain plate represents how people would send food to their neighbors. Syrian and Jewish fabric fragments on a clothes line embody the region’s diversity; and the decorations on a building mimic Greek and Roman symbols all over old city streets. Hafez’s most recent series, Damascene Athan, is a set of sculptures inspired by old Aleppo and Damascus. Many of the structures create bathos – an effect of anticlimax – an impression which Hafez says springs from his own recent revelation that he and other displaced Syrians may not return to Syria anytime soon. The art is an expression of this realization, as well as a way of mourning the romantic notion of homecoming. Each remodel is nestled inside a decorative mirror frame reminiscent of a Victorian style that was popular in Syria. But the allusion goes beyond aesthetic to speak to the emotional baggage Hafez sees inside himself. But the tone that Damascene Athan strikes is nostalgic. In this sense, the series is about preserving the past for people who never knew it. Many of the sculptures achieve this ambition ingeniously, and one – a miniature courtyard house modelled on the home where Hafez’s father grew up – really stands out. An audioscape floods the homely scene, switching between familiar sounds such as calls to prayer or children playing in the street. Hafez secretly captured the recordings while he and his friends played cards at a cafe in 2011. The piece shows Syria happy, at peace; incorporating the everyday cultural moments Hafez remembers. Hafez understands the challenges that Syrian children face as a result of their origins. 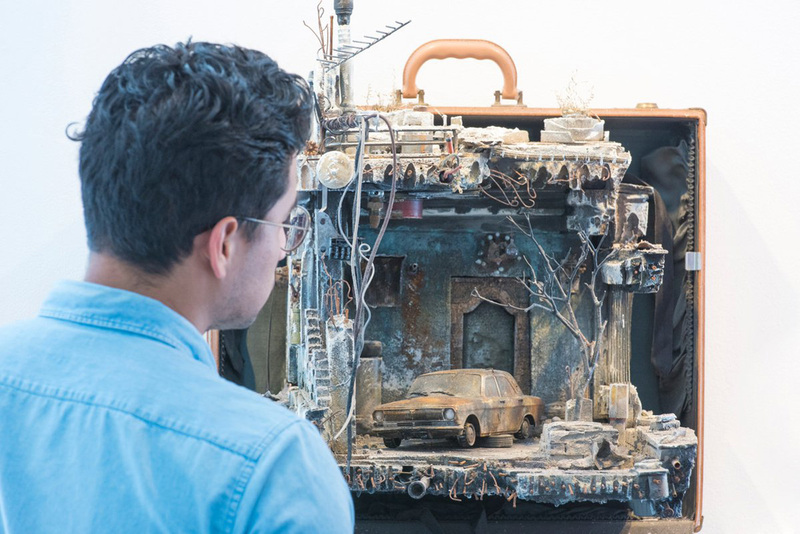 Through sculptures like the courtyard house, he hopes to show younger members of the Syrian diaspora why they should be proud of everything they bring to the table – including their homeland.